Since ancient times, lines of communication have passed through this area. The Rykneld Way, a Roman military road linking Eboracum (York) with Little Chester (Derby) forms the Eastern boundary of Harthill parish. Now named Packman Lane, it’s a reminder that packhorse trains journeyed along this way long before later roads were constructed. Harthill has been a settlement here since before the Norman conquest and is recorded in the Domesday Book. The Chesterfield Canal, the railway and the M1 motorway, all now pass through the Parish. The village has seen many changes over the centuries. 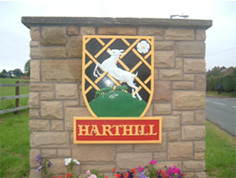 Originally Harthill was a self sufficient agricultural community. Later when coal mines were opened in the surrounding area, mining families moved in and caused the village to grow. In the last 50 years, Harthill has seen further expansion, with many residents commuting to work in the city of Sheffield or other towns nearby. Harthill still retains many attractive features of its historic past, alongside a modern and vibrant community. Today the village has an excellent primary school, two churches, a post office, two pubs, plus several shops and local businesses. For more than 35 years, the Harthill Morris has been a proud member of the village, regularly supporting many of its activities and other organisations.